Alberta is a western province of Canada. With an estimated population of 4,067,175 as of 2016 census, it is Canada's fourth-most populous province and the most populous of Canada's three prairie provinces. Its area is about 660,000 square kilometres (250,000 sq mi). Alberta and its neighbour Saskatchewan were districts of the Northwest Territories until they were established as provinces on September 1, 1905. The premier has been Rachel Notley since May 2015. Alberta is bounded by the provinces of British Columbia to the west and Saskatchewan to the east, the Northwest Territories to the north, and the U.S. state of Montana to the south. Alberta is one of three Canadian provinces and territories to border only a single U.S. state and one of only two landlocked provinces. It has a predominantly humid continental climate, with stark contrasts over a year; but seasonal temperature average swings are smaller than in areas further east, due to winters being warmed by occasional chinook winds bringing sudden warming. Alberta's capital, Edmonton, is near the geographic centre of the province and is the primary supply and service hub for Canada's crude oil, the Athabasca oil sands and other northern resource industries. About 290 km (180 mi) south of the capital is Calgary, the largest city in Alberta. Calgary and Edmonton centre Alberta's two census metropolitan areas, both of which have populations exceeding one million, while the province has 16 census agglomerations. Tourist destinations in the province include Banff, Canmore, Drumheller, Jasper and Sylvan Lake. Alberta is named after Princess Louise Caroline Alberta (1848–1939), the fourth daughter of Victoria, Queen of Canada, and Albert, Prince Consort. Princess Louise was the wife of John Campbell, Marquess of Lorne, Governor General of Canada (1878–83). Lake Louise and Mount Alberta were also named in her honour. Alberta, with an area of 661,848 km2 (255,500 sq mi), is the fourth largest province after Quebec, Ontario and British Columbia. To the south, the province borders on the 49th parallel north, separating it from the US state of Montana, while on the north the 60th parallel north divides it from the Northwest Territories. To the east, the 110th meridian west separates it from the province of Saskatchewan, while on the west its boundary with British Columbia follows the 120th meridian west south from the Northwest Territories at 60°N until it reaches the Continental Divide at the Rocky Mountains, and from that point follows the line of peaks marking the Continental Divide in a generally southeasterly direction until it reaches the Montana border at 49°N. The province extends 1,223 km (760 mi) north to south and 660 km (410 mi) east to west at its maximum width. 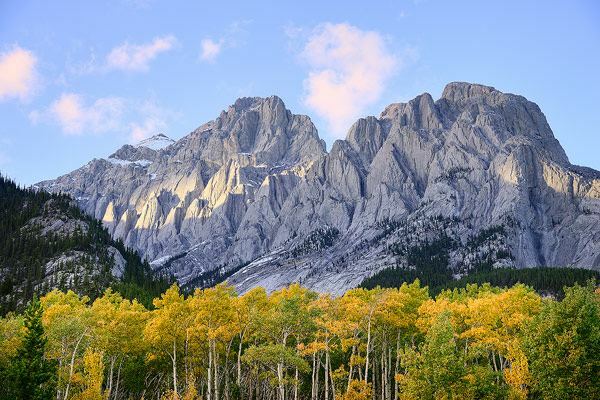 Its highest point is 3,747 m (12,293 ft) at the summit of Mount Columbia in the Rocky Mountains along the southwest border while its lowest point is 152 m (499 ft) on the Slave River in Wood Buffalo National Park in the northeast. With the exception of the semi-arid steppe of the south-eastern section, the province has adequate water resources. There are numerous rivers and lakes used for swimming, fishing and a range of water sports. There are three large lakes, Lake Claire (1,436 km2 (554 sq mi)) in Wood Buffalo National Park, Lesser Slave Lake (1,168 km2 (451 sq mi)), and Lake Athabasca (7,898 square kilometres (3,049 sq mi)) which lies in both Alberta and Saskatchewan. The longest river in the province is the Athabasca River which travels 1,538 km (956 mi) from the Columbia Icefield in the Rocky Mountains to Lake Athabasca. The largest river is the Peace River with an average flow of 2161 m3/s. The Peace River originates in the Rocky Mountains of northern British Columbia and flows through northern Alberta and into the Slave River, a tributary of the Mackenzie River. Alberta's capital city, Edmonton, is located approximately in the geographic centre of the province. It is the most northerly major city in Canada, and serves as a gateway and hub for resource development in northern Canada. The region, with its proximity to Canada's largest oil fields, has most of western Canada's oil refinery capacity. Calgary is located approximately 280 km (170 mi) south of Edmonton and 240 km (150 mi) north of Montana, surrounded by extensive ranching country. Almost 75% of the province's population lives in the Calgary–Edmonton Corridor. The land grant policy to the railroads served as a means to populate the province in its early years. Most of the northern half of the province is boreal forest, while the Rocky Mountains along the southwestern boundary are largely forested (see Alberta Mountain forests and Alberta-British Columbia foothills forests). The southern quarter of the province is prairie, ranging from shortgrass prairie in the southeastern corner to mixed grass prairie in an arc to the west and north of it. The central aspen parkland region extending in a broad arc between the prairies and the forests, from Calgary, north to Edmonton, and then east to Lloydminster, contains the most fertile soil in the province and most of the population. Much of the unforested part of Alberta is given over either to grain or to dairy farming, with mixed farming more common in the north and centre, while ranching and irrigated agriculture predominate in the south. The Alberta badlands are located in southeastern Alberta, where the Red Deer River crosses the flat prairie and farmland, and features deep canyons and striking landforms. Dinosaur Provincial Park, near Brooks, Alberta, showcases the badlands terrain, desert flora, and remnants from Alberta's past when dinosaurs roamed the then lush landscape. Alberta has a humid continental climate with warm summers and cold winters. The province is open to cold arctic weather systems from the north, which often produce extremely cold conditions in winter. As the fronts between the air masses shift north and south across Alberta, the temperature can change rapidly. Arctic air masses in the winter produce extreme minimum temperatures varying from −54 °C (−65 °F) in northern Alberta to −46 °C (−51 °F) in southern Alberta, although temperatures at these extremes are rare. In the summer, continental air masses have produced record maximum temperatures from 32 °C (90 °F) in the mountains to over 40 °C (104 °F) in southeastern Alberta. Alberta extends for over 1,200 km (750 mi) from north to south; its climate, therefore, varies considerably. Average high temperatures in January range from 0 °C (32 °F) in the southwest to −24 °C (−11 °F) in the far north. The climate is also influenced by the presence of the Rocky Mountains to the southwest, which disrupt the flow of the prevailing westerly winds and cause them to drop most of their moisture on the western slopes of the mountain ranges before reaching the province, casting a rain shadow over much of Alberta. The northerly location and isolation from the weather systems of the Pacific Ocean cause Alberta to have a dry climate with little moderation from the ocean. Annual precipitation ranges from 300 mm (12 in) in the southeast to 450 mm (18 in) in the north, except in the foothills of the Rocky Mountains where total precipitation including snowfall can reach 600 mm (24 in) annually. The province is the namesake of the Alberta clipper, a type of intense, fast-moving winter storm that generally forms over or near the province and pushed with great speed by the continental polar jetstream descends over the rest of Southern Canada and the northern tier of the United States. In the summer, the average daytime temperatures range from around 21 °C (70 °F) in the Rocky Mountain valleys and far north, up to around 28 °C (82 °F) in the dry prairie of the southeast. The northern and western parts of the province experience higher rainfall and lower evaporation rates caused by cooler summer temperatures. The south and east-central portions are prone to drought-like conditions sometimes persisting for several years, although even these areas can receive heavy precipitation, sometimes resulting in flooding. Alberta is a sunny province. Annual bright sunshine totals range between 1900 up to just under 2600 hours per year. Northern Alberta gets about 18 hours of daylight in the summer. In southwestern Alberta, the cold winters are frequently interrupted by warm, dry chinook winds blowing from the mountains, which can propel temperatures upward from frigid conditions to well above the freezing point in a very short period. During one chinook recorded at Pincher Creek, temperatures soared from −19 to 22 °C (−2.2 to 72 °F) in just one hour. The region around Lethbridge has the most chinooks, averaging 30 to 35 chinook days per year. Calgary has a 56% chance of a white Christmas, while Edmonton has an 86% chance. Northern Alberta is mostly covered by boreal forest and has a subarctic climate. The agricultural area of southern Alberta has a semi-arid steppe climate because the annual precipitation is less than the water that evaporates or is used by plants. The southeastern corner of Alberta, part of the Palliser Triangle, experiences greater summer heat and lower rainfall than the rest of the province, and as a result suffers frequent crop yield problems and occasional severe droughts. Western Alberta is protected by the mountains and enjoys the mild temperatures brought by winter chinook winds. Central and parts of northwestern Alberta in the Peace River region are largely aspen parkland, a biome transitional between prairie to the south and boreal forest to the north. After Saskatchewan, Alberta experiences the most tornadoes in Canada with an average of 15 verified per year. Thunderstorms, some of them severe, are frequent in the summer, especially in central and southern Alberta. The region surrounding the Calgary–Edmonton Corridor is notable for having the highest frequency of hail in Canada, which is caused by orographic lifting from the nearby Rocky Mountains, enhancing the updraft/downdraft cycle necessary for the formation of hail. In central and northern Alberta the arrival of spring is marked by the early flowering of the prairie crocus anemone; this member of the buttercup family has been recorded flowering as early as March, though April is the usual month for the general population. Other prairie flora known to flower early are the golden bean and wild rose. Members of the sunflower family blossom on the prairie in the summer months between July and September. The southern and east central parts of Alberta are covered by short prairie grass, which dries up as summer lengthens, to be replaced by hardy perennials such as the prairie coneflower, fleabane, and sage. Both yellow and white sweet clover can be found throughout the southern and central areas of the province. The trees in the parkland region of the province grow in clumps and belts on the hillsides. These are largely deciduous, typically aspen, poplar, and willow. Many species of willow and other shrubs grow in virtually any terrain. On the north side of the North Saskatchewan River evergreen forests prevail for thousands of square kilometres. Aspen poplar, balsam poplar (or in some parts cottonwood), and paper birch are the primary large deciduous species. Conifers include jack pine, Rocky Mountain pine, lodgepole pine, both white and black spruce, and the deciduous conifer tamarack. The four climatic regions (alpine, boreal forest, parkland, and prairie) of Alberta are home to many different species of animals. The south and central prairie was the land of the bison, commonly known as buffalo, its grasses providing pasture and breeding ground for millions of buffalo. The buffalo population was decimated during early settlement, but since then buffalo have made a comeback, living on farms and in parks all over Alberta. Alberta is home to many large carnivores. Among them are the grizzly and black bears, which are found in the mountains and wooded regions. Smaller carnivores of the canine and feline families include coyotes, wolves, fox, lynx, bobcat and mountain lion (cougar). Herbivorous animals are found throughout the province. Moose, mule deer, elk, and white-tail deer are found in the wooded regions, and pronghorn can be found in the prairies of southern Alberta. Bighorn sheep and mountain goats live in the Rocky Mountains. Rabbits, porcupines, skunks, squirrels and many species of rodents and reptiles live in every corner of the province. Alberta is home to only one variety of venomous snake, the prairie rattlesnake. Central and northern Alberta and the region farther north is the nesting ground of many migratory birds. Vast numbers of ducks, geese, swans and pelicans arrive in Alberta every spring and nest on or near one of the hundreds of small lakes that dot northern Alberta. Eagles, hawks, owls and crows are plentiful, and a huge variety of smaller seed and insect-eating birds can be found. 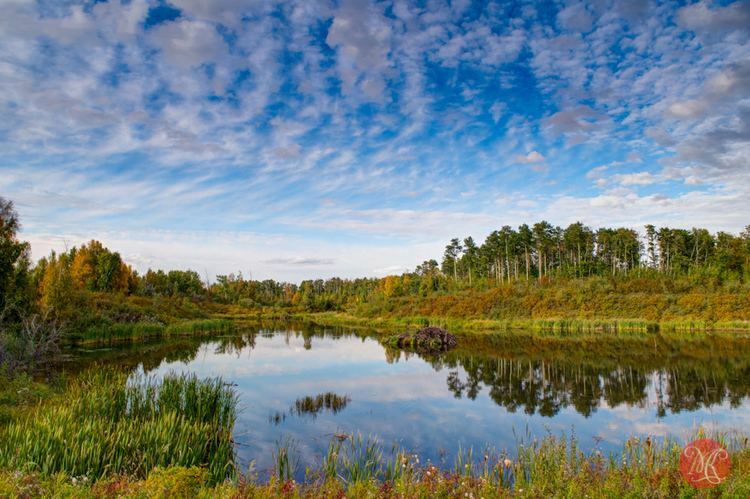 Alberta, like other temperate regions, is home to mosquitoes, flies, wasps, and bees. Rivers and lakes are populated with pike, walleye, whitefish, rainbow, speckled, brown trout, and sturgeon. Bull trout, native to the province, is Alberta's provincial fish. Turtles are found in some water bodies in the southern part of the province. Frogs and salamanders are a few of the amphibians that make their homes in Alberta. Alberta is the only province in Canada—as well as one of the few places in the world—that is free of Norwegian rats. Since the early 1950s, the Government of Alberta has operated a rat-control program, which has been so successful that only isolated instances of wild rat sightings are reported, usually of rats arriving in the province aboard trucks or by rail. In 2006, Alberta Agriculture reported zero findings of wild rats; the only rat interceptions have been domesticated rats that have been seized from their owners. It is illegal for individual Albertans to own or keep Norwegian rats of any description; the animals can only be kept in the province by zoos, universities and colleges, and recognized research institutions. In 2009, several rats were found and captured, in small pockets in southern Alberta, putting Alberta's rat-free status in jeopardy. A colony of rats were subsequently found in a landfill near Medicine Hat in 2012, and again in 2014. Alberta has one of the greatest diversities and abundances of Late Cretaceous dinosaur fossils in the world. Taxa are represented by complete fossil skeletons, isolated material, microvertebrate remains, and even mass graves. At least 38 dinosaur type specimens were collected in the province. The Foremost Formation, Oldman Formation and Dinosaur Park Formations collectively comprise the Judith River Group and are the most thoroughly studied dinosaur-bearing strata in Alberta. Dinosaur-bearing strata are distributed widely throughout Alberta. The Dinosaur Provincial Park area contains outcrops of the Dinosaur Park Formation and Oldman Formation. In the central and southern regions of Alberta are intermittent Scollard Formation outcrops. In the Drumheller Valley and Edmonton regions there are exposed Horseshoe Canyon facies. Other formations have been recorded as well, like the Milk River and Foremost Formations. However, these latter two have a lower diversity of documented dinosaurs, primarily due to their lower total fossil quantity and neglect from collectors who are hindered by the isolation and scarcity of exposed outcrops. Their dinosaur fossils are primarily teeth recovered from microvertebrate fossil sites. Additional geologic formations that have produced only few fossils are the Belly River Group and St. Mary River Formations of the southwest and the northwestern Wapiti Formation. The Wapiti Formation contains two Pachyrhinosaurus bone beds that break its general trend of low productivity, however. The Bearpaw Formation represents strata deposited during a marine transgression. Dinosaurs are known from this Formation, but represent specimens washed out to sea or reworked from older sediments. Paleo-Indians arrived in Alberta at least 10,000 years ago, toward the end of the last ice age. They are thought to have migrated from Siberia to Alaska on a land bridge across the Bering Strait and then possibly moved down the east side of the Rocky Mountains through Alberta to settle the Americas. Others may have migrated down the coast of British Columbia and then moved inland. Over time they differentiated into various First Nations peoples, including the Plains Indian tribes of southern Alberta such as those of the Blackfoot Confederacy and the Plains Cree, who generally lived by hunting buffalo (American bison), and the more northerly tribes such as the Woodland Cree and Chipewyan who hunted, trapped, and fished for a living. After the British arrival in Canada, approximately half of the province of Alberta, south of the Athabasca River drainage, became part of Rupert's Land which consisted of all land drained by rivers flowing into Hudson Bay. This area was granted by Charles II of England to the Hudson's Bay Company (HBC) in 1670, and rival fur trading companies were not allowed to trade in it. After the arrival of French Canadians in the west around 1731, they settled near fur trading posts, establishing communities such as Lac La Biche and Bonnyville. Fort La Jonquière was established near what is now Calgary in 1752. The Athabasca River and the rivers north of it were not in HBC territory because they drained into the Arctic Ocean instead of Hudson Bay, and they were prime habitat for fur-bearing animals. 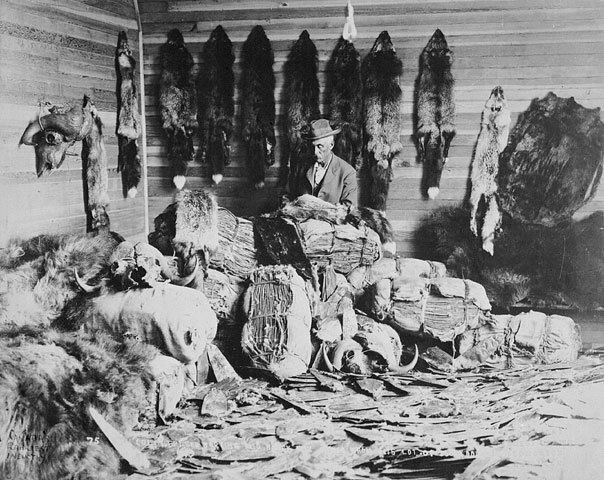 The first explorer of the Athabasca region was Peter Pond, who learned of the Methye Portage, which allowed travel from southern rivers into the rivers north of Rupert's Land. Fur traders formed the North West Company (NWC) of Montreal to compete with the HBC in 1779. The NWC occupied the northern part of Alberta territory. Peter Pond built Fort Athabasca on Lac la Biche in 1778. Roderick Mackenzie built Fort Chipewyan on Lake Athabasca ten years later in 1788. His cousin, Sir Alexander Mackenzie, followed the North Saskatchewan River to its northernmost point near Edmonton, then setting northward on foot, trekked to the Athabasca River, which he followed to Lake Athabasca. It was there he discovered the mighty outflow river which bears his name—the Mackenzie River—which he followed to its outlet in the Arctic Ocean. Returning to Lake Athabasca, he followed the Peace River upstream, eventually reaching the Pacific Ocean, and so he became the first European to cross the North American continent north of Mexico. The extreme southernmost portion of Alberta was part of the French (and Spanish) territory of Louisiana, sold to the United States in 1803; in 1818, the portion of Louisiana north of the Forty-Ninth Parallel was ceded to Great Britain. Fur trade expanded in the north, but bloody battles occurred between the rival HBC and NWC, and in 1821 the British government forced them to merge to stop the hostilities. The amalgamated Hudson's Bay Company dominated trade in Alberta until 1870, when the newly formed Canadian Government purchased Rupert's Land. Northern Alberta was included in the North-Western Territory until 1870, when it and Rupert's land became Canada's Northwest Territories. The District of Alberta was created as part of the North-West Territories in 1882. As settlement increased, local representatives to the North-West Legislative Assembly were added. After a long campaign for autonomy, in 1905 the District of Alberta was enlarged and given provincial status, with the election of Alexander Cameron Rutherford as the first premier. On June 21, 2013, during the 2013 Alberta floods Alberta experienced heavy rainfall that triggered catastrophic flooding throughout much of the southern half of the province along the Bow, Elbow, Highwood and Oldman rivers and tributaries. A dozen municipalities in Southern Alberta declared local states of emergency on June 21 as water levels rose and numerous communities were placed under evacuation orders. In 2016, a wildfire resulted in the largest evacuation of residents in Alberta's history, as more than 80,000 people were ordered to evacuate. The 2016 census reported Alberta had a population of 4,067,175 living in 1,527,678 of its 1,654,129 total dwellings, an 11.6% change from its 2011 population of 3,645,257. With a land area of 640,330.46 km2 (247,232.97 sq mi), it had a population density of 6.4/km2 (16.5/sq mi) in 2016. Statistics Canada estimated the province to have a population of 4,280,127 in Q1 of 2017. Alberta has experienced a relatively high rate of growth in recent years, mainly because of its burgeoning economy. Between 2003 and 2004, the province had high birthrates (on par with some larger provinces such as British Columbia), relatively high immigration, and a high rate of interprovincial migration compared to other provinces. About 81% of the population lives in urban areas and only about 19% in rural areas. The Calgary–Edmonton Corridor is the most urbanized area in the province and is one of the most densely populated areas of Canada. Many of Alberta's cities and towns have experienced very high rates of growth in recent history. Alberta's population rose from 73,022 in 1901 to 3,290,350 according to the 2006 census. The 2006 census found that English, with 2,576,670 native speakers, was the most common mother tongue of Albertans, representing 79.99% of the population. The next most common mother tongues were Chinese with 97,275 native speakers (3.02%), followed by German with 84,505 native speakers (2.62%) and French with 61,225 (1.90%). Other mother tongues include: Punjabi, with 36,320 native speakers (1.13%); Tagalog, with 29,740 (0.92%); Ukrainian, with 29,455 (0.91%); Spanish, with 29,125 (0.90%); Polish, with 21,990 (0.68%); Arabic, with 20,495 (0.64%); Dutch, with 19,980 (0.62%); and Vietnamese, with 19,350 (0.60%). The most common aboriginal language is Cree 17,215 (0.53%). Other common mother tongues include Italian with 13,095 speakers (0.41%); Urdu with 11,275 (0.35%); and Korean with 10,845 (0.33%); then Hindi 8,985 (0.28%); Persian 7,700 (0.24%); Portuguese 7,205 (0.22%); and Hungarian 6,770 (0.21%). Alberta has considerable ethnic diversity. In line with the rest of Canada, many immigrants originated from England, Scotland, Ireland, Wales and France, but large numbers also came from other parts of Europe, notably Germany, Ukraine and Scandinavia. According to Statistics Canada, Alberta is home to the second highest proportion (two percent) of Francophones in western Canada (after Manitoba). Despite this, relatively few Albertans claim French as their mother tongue. Many of Alberta's French-speaking residents live in the central and northwestern regions of the province. As reported in the 2001 census, the Chinese represented nearly four percent of Alberta's population, and East Indians represented more than two percent. Both Edmonton and Calgary have historic Chinatowns, and Calgary has Canada's third largest Chinese community. The Chinese presence began with workers employed in the building of the Canadian Pacific Railway in the 1880s. Aboriginal Albertans make up approximately three percent of the population. Amongst those of British origins, the Scots have had a particularly strong influence on place-names, with the names of many cities and towns including Calgary, Airdrie, Canmore, and Banff having Scottish origins. Alberta is the third most diverse province in terms of visible minorities after British Columbia and Ontario with 13.9% of the population consisting of visible minorities. Nearly one-fourth of the populations of Calgary and Edmonton belong to a visible minority group. Aboriginal Identity Peoples make up 5.8% of the population, about half of whom consist of North American Indians and the other half are Metis. There are also small number of Inuit people in Alberta. The number of Aboriginal Identity Peoples have been increasing at a rate greater than the population of Alberta. As of the 2011 National Household Survey, the largest religious group was Roman Catholic, representing 24.3% of the population. Alberta had the second highest percentage of non-religious residents among the provinces (after British Columbia) at 31.6% of the population. Of the remainder, 7.5% of the population identified themselves as belonging to the United Church of Canada, while 3.9% were Anglican. Lutherans made up 3.3% of the population while Baptists comprised 1.9%. The remainder belonged to a wide variety of different religious affiliations, none of which constituted more than 2% of the population. Members of LDS Church are mostly concentrated in the extreme south of the province. Alberta has a population of Hutterites, a communal Anabaptist sect similar to the Mennonites, and has a significant population of Seventh-day Adventists. Alberta is home to several Byzantine Rite Churches as part of the legacy of Eastern European immigration, including the Ukrainian Catholic Eparchy of Edmonton, and the Ukrainian Orthodox Church of Canada's Western Diocese which is based in Edmonton. Muslims, Sikhs, Buddhists, and Hindus live in Alberta. Muslims made up 3.2% of the population, Sikhs 1.5%, Buddhists 1.2%, and Hindus 1.0%. Many of these are recent immigrants, but others have roots that go back to the first settlers of the prairies. Canada's oldest mosque, the Al-Rashid Mosque, is located in Edmonton, whereas Calgary is home to Canada's largest mosque, the Baitun Nur mosque. Alberta is also home to a growing Jewish population of about 15,400 people who constituted 0.3% of Alberta's population. Most of Alberta's Jews live in the metropolitan areas of Calgary (8,200) and Edmonton (5,500). Alberta's economy was one of the strongest in the world, supported by the burgeoning petroleum industry and to a lesser extent, agriculture and technology. In 2013 Alberta's per capita GDP exceeded that of the United States, Norway, or Switzerland, and was the highest of any province in Canada at C$84,390. This was 56% higher than the national average of C$53,870 and more than twice that of some of the Atlantic provinces. In 2006 the deviation from the national average was the largest for any province in Canadian history. According to the 2006 census, the median annual family income after taxes was $70,986 in Alberta (compared to $60,270 in Canada as a whole). Alberta's debt-to-GDP ratio is projected to reach 11.4% in fiscal year 2019-2020, compared to a surplus-to-GDP ratio of 13.4% in 2009-2010. The Calgary-Edmonton Corridor is the most urbanized region in the province and one of the densest in Canada. The region covers a distance of roughly 400 kilometres north to south. In 2001, the population of the Calgary-Edmonton Corridor was 2.15 million (72% of Alberta's population). It is also one of the fastest growing regions in the country. A 2003 study by TD Bank Financial Group found the corridor to be the only Canadian urban centre to amass a US level of wealth while maintaining a Canadian style quality of life, offering universal health care benefits. The study found that GDP per capita in the corridor was 10% above average US metropolitan areas and 40% above other Canadian cities at that time. The Fraser Institute states that Alberta also has very high levels of economic freedom and rates Alberta as the freest economy in Canada, and the second freest economy amongst US states and Canadian provinces. The government of Alberta has invested its earnings wisely; as of September 30, 2013, official statistics reported nearly 500 holdings. In 2014, Merchandise exports totalled US$121.4 Billion. Energy revenues totalled $111.7 Billion and Energy resource exports totalled $90.8 Billion. Farm Cash receipts from agricultural products totalled $12.9 Billion. Shipments of forest products totalled $5.4 Billion while exports were $2.7 Billion. Manufacturing sales totaled $79.4 Billion, and Alberta's ICT industries generated over $13 Billion in revenue. In total, Alberta's 2014 GDP amassed $364.5 Billion in 2007 dollars, or $414.3 Billion in 2015 dollars. In 2015, Alberta's GDP grew despite low oil prices, however it was unstable with growth rates as high 4.4% and as low as 0.2%. Should the GDP remain at an average of 2.2% for the last two quarters of 2015, Alberta's GDP should exceed $430 Billion by the end of 2015. However, RBC Economics research predicts Alberta's real GDP growth to only average 0.6% for the last 2 quarters of 2015. This estimate predicts a real GDP growth of only 1.4% for 2015. A positive is the predicted 10.8% growth in Nominal GDP, and possibly above 11% in 2016. Alberta is the largest producer of conventional crude oil, synthetic crude, natural gas and gas products in Canada. Alberta is the world’s second largest exporter of natural gas and the fourth largest producer. Two of the largest producers of petrochemicals in North America are located in central and north-central Alberta. In both Red Deer and Edmonton, polyethylene and vinyl manufacturers produce products that are shipped all over the world. Edmonton's oil refineries provide the raw materials for a large petrochemical industry to the east of Edmonton. The Athabasca oil sands surrounding Fort McMurray have estimated unconventional oil reserves approximately equal to the conventional oil reserves of the rest of the world, estimated to be 1.6 trillion barrels (254 km3). Many companies employ both conventional strip mining and non-conventional in situ methods to extract the bitumen from the oil sands. As of late 2006 there were over $100 billion in oil sands projects under construction or in the planning stages in northeastern Alberta. Another factor determining the viability of oil extraction from the oil sands is the price of oil. The oil price increases since 2003 have made it profitable to extract this oil, which in the past would give little profit or even a loss. By mid-2014 however rising costs and stabilizing oil prices were threatening the economic viability of some projects. An example of this was the shelving of the Joslyn north project in the Athabasca region in May 2014. With concerted effort and support from the provincial government, several high-tech industries have found their birth in Alberta, notably patents related to interactive liquid-crystal display systems. With a growing economy, Alberta has several financial institutions dealing with civil and private funds. Agriculture has a significant position in the province's economy. The province has over three million head of cattle, and Alberta beef has a healthy worldwide market. Nearly one half of all Canadian beef is produced in Alberta. Alberta is one of the top producers of plains buffalo (bison) for the consumer market. Sheep for wool and mutton are also raised. Wheat and canola are primary farm crops, with Alberta leading the provinces in spring wheat production; other grains are also prominent. Much of the farming is dryland farming, often with fallow seasons interspersed with cultivation. Continuous cropping (in which there is no fallow season) is gradually becoming a more common mode of production because of increased profits and a reduction of soil erosion. Across the province, the once common grain elevator is slowly being lost as rail lines are decreasing; farmers typically truck the grain to central points. Forestry plays a vital role in Alberta's economy, providing over 15,000 jobs and contributing billions of dollars annually. Uses for harvested timber include pulpwood, hardwood, engineered wood and bioproducts such as chemicals and biofuels. Recently, the United States has been Canada and Alberta's largest importer of hardwood and pulpwood, although continued trades issues (Canada–United_States_softwood_lumber_dispute) with the U.S. have likely been a contributing factor towards Alberta's increased focus on Asian markets. Alberta has been a tourist destination from the early days of the twentieth century, with attractions including outdoor locales for skiing, hiking and camping, shopping locales such as West Edmonton Mall, Calgary Stampede, outdoor festivals, professional athletic events, international sporting competitions such as the Commonwealth Games and Olympic Games, as well as more eclectic attractions. There are also natural attractions like Elk Island National Park, Wood Buffalo National Park, and the Columbia Icefield. According to Alberta Economic Development, Calgary and Edmonton both host over four million visitors annually. Banff, Jasper and the Rocky Mountains are visited by about three million people per year. Alberta tourism relies heavily on Southern Ontario tourists, as well as tourists from other parts of Canada, the United States, and many other countries. Alberta's Rockies include well-known tourist destinations Banff National Park and Jasper National Park. The two mountain parks are connected by the scenic Icefields Parkway. Banff is located 128 km (80 mi) west of Calgary on Highway 1, and Jasper is located 366 km (227 mi) west of Edmonton on Yellowhead Highway. Five of Canada's fourteen UNESCO World heritage sites are located within the province: Canadian Rocky Mountain Parks, Waterton-Glacier International Peace Park, Wood Buffalo National Park, Dinosaur Provincial Park and Head-Smashed-In Buffalo Jump. About 1.2 million people visit the Calgary Stampede, a celebration of Canada's own Wild West and the cattle ranching industry. About 700,000 people enjoy Edmonton's K-Days (formerly Klondike Days and Capital EX). 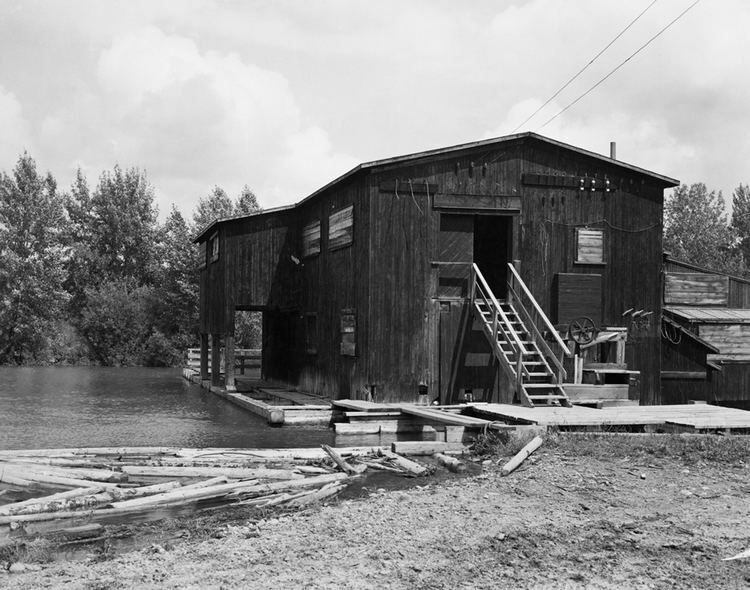 Edmonton was the gateway to the only all-Canadian route to the Yukon gold fields, and the only route which did not require gold-seekers to travel the exhausting and dangerous Chilkoot Pass. Another tourist destination that draws more than 650,000 visitors each year is the Drumheller Valley, located northeast of Calgary. Drumheller, "Dinosaur Capital of The World", offers the Royal Tyrrell Museum of Palaeontology. Drumheller also had a rich mining history being one of Western Canada's largest coal producers during the war years. Located in east-central Alberta is Alberta Prairie Railway Excursions, a popular tourist attraction operated out of Stettler, that offers train excursions into the prairie and caters to tens of thousands of visitors every year. Alberta has numerous ski resorts most notably Sunshine Village, Lake Louise, Marmot Basin, Norquay and Nakiska. The Government of Alberta is organized as a parliamentary democracy with a unicameral legislature. Its unicameral legislature—the Legislative Assembly—consists of eighty-seven members elected first past the post (FPTP) from single-member constituencies. Locally municipal governments and school boards are elected and operate separately. Their boundaries do not necessarily coincide. As Canada's head of state, Queen Elizabeth II is the head of state for the Government of Alberta. Her duties in Alberta are carried out by Lieutenant Governor Lois Mitchell. The Queen and lieutenant governor are figureheads whose actions are highly restricted by custom and constitutional convention. The lieutenant governor handles numerous honorific duties in the name of the Queen. The government is headed by the premier. The premier is normally a member of the Legislative Assembly, and draws all the members of the Cabinet from among the members of the Legislative Assembly. The City of Edmonton is the seat of the provincial government—the capital of Alberta. The current premier is Rachel Notley, sworn in on May 24, 2015. The previous premier was Jim Prentice, who became the leader of the then governing Progressive Conservatives on September 6, 2014, following the resignation of Alison Redford and the interim leadership of Dave Hancock. Prentice was sworn in as the 16th Premier of Alberta on September 15, 2014. He called an early election on May 5, 2015 in which the opposition New Democratic Party (NDP) won a majority of the seats. Prentice immediately resigned his seat and leadership of the PC party, but remained premier until Notley was sworn in on May 24, 2015. Alberta's elections have tended to yield much more conservative outcomes than those of other Canadian provinces. Since the 1960s, Alberta has had three main political parties, the Progressive Conservatives ("Conservatives" or "Tories"), the Liberals, and the social democratic New Democrats. The Wildrose Party, a more conservative party formed in early 2008, gained much support in 2012 election and became the official opposition, a role it still holds today. The strongly conservative Social Credit Party was a power in Alberta for many decades, but fell from the political map after the Progressive Conservatives came to power in 1971. For 44 years the Progressive Conservatives governed Alberta. They lost the 2015 election to the NDP, signalling a possible shift to the left in the province, also indicated by the election of progressive mayors in both of Alberta's major cities. Since becoming a province in 1905, Alberta has seen only four changes of government - only five parties have governed Alberta: the Liberals, from 1905 to 1921; the United Farmers of Alberta, from 1921 to 1935; the Social Credit Party, from 1935 to 1971, the Progressive Conservative Party, from 1971 to 2015: and the currently governing Alberta New Democratic Party. Alberta has had occasional surges in separatist sentiment. Even during the 1980s, when these feelings were at their strongest, there has not been enough interest in secession to initiate any major movement or referendum. Several groups are currently active promoting independence for Alberta in some form. Government revenue comes mainly from royalties on non-renewable natural resources (30.4%), personal income taxes (22.3%), corporate and other taxes (19.6%), and grants from the federal government primarily for infrastructure projects (9.8%). Albertans are the lowest-taxed people in Canada, and Alberta is the only province in Canada without a provincial sales tax (but residents are still subject to the federal sales tax, the Goods and Services Tax of 5%). It is also the only Canadian province to have a flat tax for personal income taxes, which is 10% of taxable income. This is likely to change with the election of an NDP government. The Alberta personal income tax system maintains a progressive character by granting residents personal tax exemptions of $17,787, in addition to a variety of tax deductions for persons with disabilities, students, and the aged. Alberta's municipalities and school jurisdictions have their own governments who usually work in co-operation with the provincial government. Alberta also privatized alcohol distribution. The privatization increased outlets from 304 stores to 1,726; 1,300 jobs to 4,000 jobs; and 3,325 products to 16,495 products. Tax revenue also increased from $400 million to $700 million. Albertan municipalities raise a significant portion of their income through levying property taxes. The value of assessed property in Alberta was approximately $727 billion in 2011. Most real property is assessed according to its market value. The exceptions to market value assessment are farmland, railways, machinery & equipment and linear property, all of which is assessed by regulated rates. Depending on the property type, property owners may appeal a property assessment to their municipal 'Local Assessment Review Board', 'Composite Assessment Review Board,' or the Alberta Municipal Government Board. Policing in the province of Alberta upon its creation was the responsibility of the Royal Northwest Mounted Police. In 1917, due to pressures of World War I, the Alberta Provincial Police was created. This organization policed the province until it was disbanded as a Great Depression era cost cutting measure in 1932. It was at that time the now renamed Royal Canadian Mounted Police resumed policing of the province, specifically RCMP "K" Division. With the advent of the Alberta Sheriffs Branch, the duties of law enforcement in Alberta has been evolving as certain aspects, such as traffic enforement, mobile surveillance and the close protection of the Premier of Alberta have been transferred to the Sheriffs. In 2006, Alberta formed the Alberta Law Enforcement Response Teams (ALERT) to combat organized crime and the serious offences that accompany it. ALERT is made up of members of the RCMP, Sheriffs Branch and various major municipal police forces in Alberta. Military bases in Alberta include Canadian Forces Base (CFB) Cold Lake, CFB Edmonton, CFB Suffield and CFB Wainwright. Air force units stationed at CFB Cold Lake have access to the Cold Lake Air Weapons Range. CFB Edmonton is the headquarters for the 3rd Canadian Division. CFB Suffield hosts British troops and is the largest training facility in Canada. Alberta has over 181,000 km (112,000 mi) of highways and roads, of which nearly 41,000 km (25,000 mi) are paved. The main north-south corridor is Highway 2, which begins south of Cardston at the Carway border crossing and is part of the CANAMEX Corridor. Highway 4, which effectively extends Interstate 15 into Alberta and is the busiest US gateway to the province, begins at the Coutts border crossing and ends at Lethbridge. Highway 3 joins Lethbridge to Fort Macleod and links Highway 2 to Highway 4. Highway 2 travels north through Fort Macleod, Calgary, Red Deer, and Edmonton. North of Edmonton, the highway continues to Athabasca, then northwesterly along the south shore of Lesser Slave Lake into High Prairie, north to Peace River, west to Fairview and finally south to Grande Prairie, where it ends at an interchange with Highway 43. The section of Highway 2 between Calgary and Edmonton has been named the Queen Elizabeth II Highway to commemorate the visit of the monarch in 2005. Highway 2 is supplemented by two more highways that run parallel to it: Highway 22, west of Highway 2, known as Cowboy Trail, and Highway 21, east of Highway 2. Highway 43 travels northwest into Grande Prairie and the Peace River Country; Highway 63 travels northeast to Fort McMurray, the location of the Athabasca oil sands. Alberta has two main east-west corridors. The southern corridor, part of the Trans-Canada Highway system, enters the province near Medicine Hat, runs westward through Calgary, and leaves Alberta through Banff National Park. The northern corridor, also part of the Trans-Canada network and known as the Yellowhead Highway (Highway 16), runs west from Lloydminster in eastern Alberta, through Edmonton and Jasper National Park into British Columbia. One of the most scenic drives is along the Icefields Parkway, which runs for 228 km (142 mi) between Jasper and Lake Louise, with mountain ranges and glaciers on either side of its entire length. A third corridor stretches across southern Alberta; Highway 3 runs between Crowsnest Pass and Medicine Hat through Lethbridge and forms the eastern portion of the Crowsnest Highway. Another major corridor through central Alberta is Highway 11 (also known as the David Thompson Highway), which runs east from the Saskatchewan River Crossing in Banff National Park through Rocky Mountain House and Red Deer, connecting with Highway 12 20 km (12 mi) west of Stettler. The highway connects many of the smaller towns in central Alberta with Calgary and Edmonton, as it crosses Highway 2 just west of Red Deer. Urban stretches of Alberta's major highways and freeways are often called trails. For example, Highway 2, the main north-south highway in the province, is called Deerfoot Trail as it passes through Calgary but becomes Calgary Trail (for southbound traffic) and Gateway Boulevard (for northbound traffic) as it enters Edmonton and then turns into St. Albert Trail as it leaves Edmonton for the City of St. Albert. Calgary, in particular, has a tradition of calling its largest urban expressways trails and naming many of them after prominent First Nations individuals and tribes, such as Crowchild Trail, Deerfoot Trail, and Stoney Trail. Calgary, Edmonton, Red Deer, Medicine Hat, and Lethbridge have substantial public transit systems. In addition to buses, Calgary and Edmonton operate light rail transit (LRT) systems. Edmonton LRT, which is underground in the downtown core and on the surface outside the CBD, was the first of the modern generation of light rail systems to be built in North America, while the Calgary C-Train has one of the highest number of daily riders of any LRT system in North America. Alberta is well-connected by air, with international airports in both Calgary and Edmonton. Calgary International Airport and Edmonton International Airport are the third and fifth busiest in Canada respectively. Calgary's airport is a hub for WestJet Airlines and a regional hub for Air Canada. Calgary's airport primarily serves the Canadian prairie provinces (Alberta, Saskatchewan and Manitoba) for connecting flights to British Columbia, eastern Canada, 15 major US centres, nine European airports, one Asian airport and four destinations in Mexico and the Caribbean. Edmonton's airport acts as a hub for the Canadian north and has connections to all major Canadian airports as well as 10 major US airports, 3 European airports and 6 Mexican and Caribbean airports. There are more than 9,000 km (5,600 mi) of operating mainline railway; the Canadian Pacific Railway and Canadian National Railway companies operate railway freight across the province. Passenger trains include Via Rail's Canadian (Toronto–Vancouver) or Jasper–Prince Rupert trains, which use the CN mainline and pass through Jasper National Park and parallel the Yellowhead Highway during at least part of their routes. The Rocky Mountaineer operates two sections: one from Vancouver to Banff and Calgary over CP tracks, and a section that travels over CN tracks to Jasper. Alberta provides a publicly funded health care system, Alberta Health Services, for all its citizens and residents as set out by the provisions of the Canada Health Act of 1984. Alberta became Canada's second province (after Saskatchewan) to adopt a Tommy Douglas-style program in 1950, a precursor to the modern medicare system. Alberta's health care budget is currently $17.1 billion during the 2013–2014 fiscal year (approximately 45% of all government spending), making it the best funded health care system per-capita in Canada. Every hour more than $1.9 million is spent on health care in the province. The Edmonton Clinic complex, completed in 2012, provides a similar research, education, and care environment as the Mayo Clinic in the United States. All public health care services funded by the Government of Alberta are delivered operationally by Alberta Health Services. AHS is the province's single health authority established on July 1, 2008, which replaced nine local health authorities. AHS also funds all ground ambulance services in the province, as well as the province-wide STARS (Shock Trauma Air Rescue Society) air ambulance service. As with any Canadian province, the Alberta Legislature has (almost) exclusive authority to make laws respecting education. Since 1905 the Legislature has used this capacity to continue the model of locally elected public and separate school boards which originated prior to 1905, as well as to create and regulate universities, colleges, technical institutions and other educational forms and institutions (public charter schools, private schools, home schooling). There are forty-two public school jurisdictions in Alberta, and seventeen operating separate school jurisdictions. Sixteen of the operating separate school jurisdictions have a Catholic electorate, and one (St. Albert) has a Protestant electorate. In addition, one Protestant separate school district, Glen Avon, survives as a ward of the St. Paul Education Region. The City of Lloydminster straddles the Alberta/Saskatchewan border, and both the public and separate school systems in that city are counted in the above numbers: both of them operate according to Saskatchewan law. For many years the provincial government has funded the greater part of the cost of providing K–12 education. Prior to 1994 public and separate school boards in Alberta had the legislative authority to levy a local tax on property as a supplementary support for local education. In 1994 the government of the province eliminated this right for public school boards, but not for separate school boards. Since 1994 there has continued to be a tax on property in support of K–12 education; the difference is that the mill rate is now set by the provincial government, the money is collected by the local municipal authority and remitted to the provincial government. The relevant legislation requires that all the money raised by this property tax must go to the support of K–12 education provided by school boards. The provincial government pools the property tax funds from across the province and distributes them, according to a formula, to public and separate school jurisdictions and Francophone authorities. Public and separate school boards, charter schools, and private schools all follow the Program of Studies and the curriculum approved by the provincial department of education (Alberta Education). Homeschool tutors may choose to follow the Program of Studies or develop their own Program of Studies. Public and separate schools, charter schools, and approved private schools all employ teachers who are certificated by Alberta Education, they administer Provincial Achievement Tests and Diploma Examinations set by Alberta Education, and they may grant high school graduation certificates endorsed by Alberta Education. The University of Alberta, located in Edmonton and established in 1908, is Alberta's oldest and largest university. The University of Calgary, once affiliated with the University of Alberta, gained its autonomy in 1966 and is now the second largest university in Alberta. Athabasca University, which focuses on distance learning, and the University of Lethbridge are located in Athabasca and Lethbridge respectively. In early September 2009, Mount Royal University became Calgary's second public university, and in late September 2009, a similar move made MacEwan University Edmonton's second public university. There are 15 colleges that receive direct public funding, along with two technical institutes, Northern Alberta Institute of Technology and Southern Alberta Institute of Technology. There is also a large and active private sector of post-secondary institutions, mostly Christian Universities, bringing the total number of universities to twelve. Students may also receive government loans and grants while attending selected private institutions. There has been some controversy in recent years over the rising cost of post-secondary education for students (as opposed to taxpayers). In 2005, Premier Ralph Klein made a promise that he would freeze tuition and look into ways of reducing schooling costs. Summer brings many festivals to the province of Alberta, especially in Edmonton. The Edmonton Fringe Festival is the world's second largest after the Edinburgh Festival. Both Calgary and Edmonton host a number of annual festivals and events, including folk music festivals. The city's "heritage days" festival sees the participation of over 70 ethnic groups. Edmonton's Churchill Square is home to a large number of the festivals, including the large Taste of Edmonton & The Works Art & Design Festival throughout the summer months. The City of Calgary is also famous for its Stampede, dubbed "The Greatest Outdoor Show on Earth". The Stampede is Canada's biggest rodeo festival and features various races and competitions, such as calf roping and bull riding. In line with the western tradition of rodeo are the cultural artisans that reside and create unique Alberta western heritage crafts. The Banff Centre hosts a range of festivals and other events including the international Mountain Film Festival. These cultural events in Alberta highlight the province's cultural diversity. Most of the major cities have several performing theatre companies who entertain in venues as diverse as Edmonton's Arts Barns and the Francis Winspear Centre for Music. Both Calgary and Edmonton are home to Canadian Football League and National Hockey League teams. Soccer, rugby union and lacrosse are also played professionally in Alberta. Alberta has relationships with several provinces, states, and other entities worldwide.